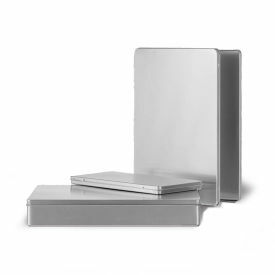 CD/ DVD Tin Boxes, 5" x 5"
Dimensions: 5-1/4" x 5-1/4" x 3/8"
Solid Tins with Clear Window, 7" x 5" x 2"
Dimensions: 6-7/8" x 5" x 1-5/8"
Solid Tins with Clear Window, 10" x 8" x 3"
Dimensions: 10" x 8-1/4" x 3-1/4"
Solid Tins with Clear Window, 4" x 3" x 2"
Dimensions: 4-1/8" x 3" x 2-1/2"
Solid Tins with Clear Window, 8" x 7" x 3"
Dimensions: 8" x 6-3/4" x 3-1/8"
Tin Boxes are ideal containers for chocolates, gourmet food, jewelry, DVDs and more! Tin Boxes come in various sizes and shapes, perfect for gift shops, jewelry stores and even general stores. Not only is each Tin Box reusable, but you can also make each box unique to your store by hot-stamping your logo or other images onto the front of the box. The possibilities for the Tin boxes are only limited by your imagination! For customizing options or to speak to a Product Expert, please contact American Retail Supply at1-800-426-5708.